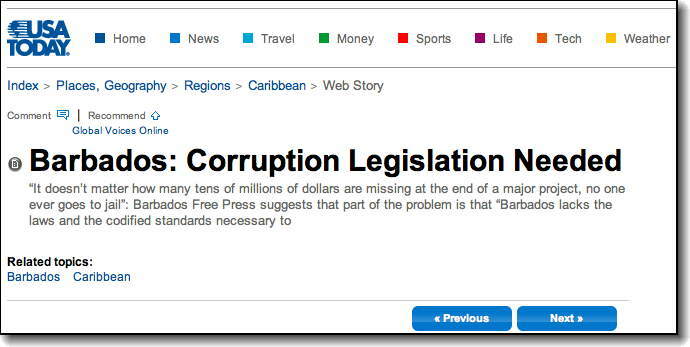 USA Today Picks Up On Barbados Free Press Corruption Article – Hit Meter Goes Wild! Welcome to our USA Today Visitors! Barbados Free Press is receiving thousands of extra visitors today thanks in large measure to coverage from USA Today – the widest circulation of any newspaper in the United States and second worldwide only to the #1 English language paper in the world – The Times of India. For the last two days our article about the tens of millions of dollars that vanished during the building of the ABC Highway has been resonating with readers in Barbados and around the world. Harvard University’s Global Voices featured the article in various international forums including Governance, Law, Media and Politics – but the visitor rocket really took off when none other than USA Today posted a paragraph and a link to the story on the newspaper’s website. So a big welcome to our thousands of extra visitors from USA Today and Harvard’s Global Voices. Barbados is a wonderful country full of good people – but we have this one huge problem with a long-established culture of corruption and entitlement in politics and government service. BFP and other reform-minded folks believe that the only way the culture will change is if the international community starts examining the Barbados government’s actions, inaction and policies with a critical eye in decisions regarding Barbados investments, property ownership and business deals. The reality of doing business in Barbados is often a shock to foreigners whose only impression of our country comes through positive press coverage by their own country’s news and entertainment media. What foreign investors don’t know is that scores of professional journalists from some of the world’s most respected news organisations visit Barbados every year as guests of Barbados government agencies for tourism and investment. Of course they write nice things about our country! And of course they stay away from contentious issues that threaten the carefully crafted image of Barbados as “Little Britain”. Buyers of Barbados condominiums are sometimes unpleasantly surprised (horrified!) to discover that Barbados lacks any laws that realistically prevent a developer from spending your money as he pleases and leaving you high and dry without your condo. Relying on our Barbados courts to solve your condo problem? Ha! Talk to Canadian John DeSanti who has been waiting 19 years for his condo! In Barbados, Rule of Law means whatever those in power want it to mean. God help you if your land deal or business agreement collapses and you have to go to the courts! You are just as likely to discover that the judges, lawyers and government officials you deal with are land-speculators themselves and are in positions of great power in a country with a population of fewer than three hundred thousand people. Consider our article Corporate Records Involving Chief Justice Simmons Missing From Barbados Government Files! A word to wise international investors – if you have any kind of a legal dispute in Barbados, don’t count on being able to access any government records as evidence. You see, if some big-up is involved in the court case, those government records will go missing until you leave the island with your tail between your legs. When the highest judge in the land is a former Attorney General and Cabinet Minister, your chances of a fair trial are about the same as winning big money in the lottery. Not to mention corrupt land expropriation! Here’s one for you: Government expropriates privately-owned land for “public housing’, then Government Minister Gline Clarke built a house for his mistress upon the same land! No Integrity Legislation exists in Barbados. As a result, powerful Government Ministers like Mr. Clarke do not have to declare their assets or explain how it is that, as a Member of the Cabinet that approves the expropriation of privately-owned lands, a Minister of Government comes to live upon a choice building lot that was forceably taken from an owner – using the full power of the Government. Integrity, transparency and accountability are just words to Barbados politicians, but to fellow taxpayers the failure of successive Barbados governments to implement and enforce ITAL (Integrity, Transparency and Accountability Legislation) says “corruption”. To international investors, the refusal of Barbados governments to define and regulate obvious conflicts of interest by elected and appointed officials says “higher risk”. After all, nothing says “banana republic” like the fact that Barbados citizens have an expectation and an acceptance that government officials can become millionaires while in office.